What Are the Benefits of Eating Dates? Dates are the fruit of the date palm tree and are grown primarily in dry, arid regions, such as the Middle East and parts of California. Though dates are often used as an ingredient in sweets and other recipes, they offer several nutritional benefits when eaten fresh and pitted. 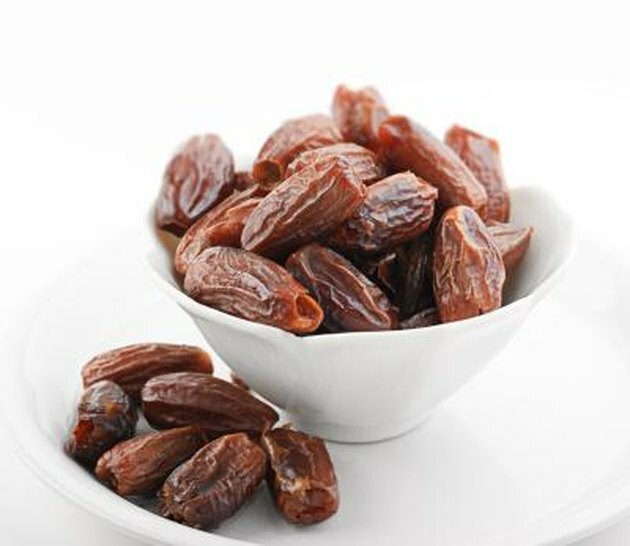 One of the main reasons people avoid eating dates is the belief that they will raise their blood sugar levels, but studies have shown that belief to be erroneous. The May 28, 2011, issue of "Nutrition Journal" reports a study in which date consumption was tested on diabetics. The study shows that while dates contain high amounts of natural sugars, they are actually a low-glycemic index food and did not significantly raise blood sugar levels after they were eaten. If you are diabetic, speak to your doctor before adding dates to your diet so that you can monitor your blood sugar levels and determine how dates affect you personally. Dates are loaded with fiber. According to the USDA National Nutrient Database, just one pitted date contains 1.6 g of fiber, or 6 percent of the recommended daily intake. Fiber is known for its ability to help lower cholesterol and fight and prevent obesity, heart disease and colorectal cancer. The November 2008 issue of "Critical Reviews in Food Science and Nutrition" reports that the fiber in dates is primarily insoluble fiber, which binds to fat and cholesterol and carries it out of the body. Though the fiber in dates has the ability to lower cholesterol levels, researchers at the Technion-Israel Institute of Technology in Israel report that dates have better results at lowering triglyceride levels, which is another type of fat in the blood. A study published in the Sept. 9, 2009, issue of the "Journal of Agricultural and Food Chemistry," shows that consuming dates may lower triglycerides by 8 to 15 percent. Reducing your triglyceride levels will lower your risk of hardening of the arteries, heart attack and stroke, according to the National Institutes of Health. Adding dates to your diet delivers vitamins and minerals that are necessary to maintain optimum health. The primary vitamins in dates are the B vitamin family, with vitamin B-6 topping the list. The B vitamins help with the metabolism of food and the formation of new blood cells. Other vitamins include K and A. Dates are an excellent source or minerals, with potassium in the No. 1 spot. Copper, manganese, magnesium, calcium, phosphorous, iron and zinc complete the mineral profile. The body only needs small amounts of minerals, but if it is depleted of any one, it can be disastrous to your health. Snacking on dates can help you build up your body's mineral stores. Are Dates Healthy During a Pregnancy?